I will never forget summers as a kid. I spent a couple of some of my finest times at Grandma and Grandpa’s house for the duration of the allotted freedom we received. I spent the days either wandering around town with Grandma running errands, or playing around with my cousins in the front yard, that place we used to go before computers took up all of our time. But most of all, I always remember when it was time to go inside and watch One Life To Live. Yes, I know, it is probably weird for a 9 or 10 year old kid to become obsessed with a Soap Opera. But dammit did I love it! I couldn’t tell you what exactly was happening during that time on the show (I know a kid fell in a well, or something of that nature) but I do remember thoroughly enjoying the craziness that was this cast. And more importantly, the lives of Blair and Todd Oh Blair! Even at my ripe young age, I knew there was something about this woman who was absolutely fascinating. She essentially played a mother who would do anything for your family. But, she wasn’t like any other mother I had known in my short lifespan, if you catch my drift. Fast forward a few years later, in the late 90’s and just before the towers fell, I was a just another strung out teen who would now a days probably be considered a hipster of some sort, even though we had no idea what that meant in those days. Sitting in someone’s basement or shabby bedroom, drinking cheap beer and telling lies, we would also watch such obscure VHS tapes like the films of Roger Corman, Tromaville, and, obviously, the Evil Dead series. It was during my first viewing of Evil Dead II that I recognized an actress who always struck a silent chord with me, but I had seemed to have forgotten in my years of teenage angst and superficiality. It was Blair once again. She was a few years younger than the last time I and watched her and Todd struggle through their daily lives on OLTL, but she was just as fascinating. And as the years go by, I still consider Kassie Wesley DePavia to be one of the pivotal actresses of our day, and a major player in my development. For 20 years she has graced the screen, and later the internet, as the illustrious Blair, and she shows no signs of slowing down, as long as the show can continue to find an outlet. Not to mention that this woman is ageless and timeless! She is just as marvelously beautiful and talented as she was when I was just a boy of ten, waiting to see how that kid got out of the well. And we are proud to announce that Mrs. DePavia herself has agree to share a few words with us, and become a part of the Trainwreck’d Society family, although she has always had a special place in my own personal history. So check it out, and maybe you will learn a little bit more about this Emmy Award nominated master of the daytime. You kicked off your acting career starring opposite Bruce Campbell in the cult class horror film Evil Dead II. What was that experience like? I had an amazing “first film” experience! Working with Bruce was like watching a Genius at work. He is an unbelievably hard worker/producer/actor. I learned a great deal that summer in 1986 working on and shooting Evil Dead II. 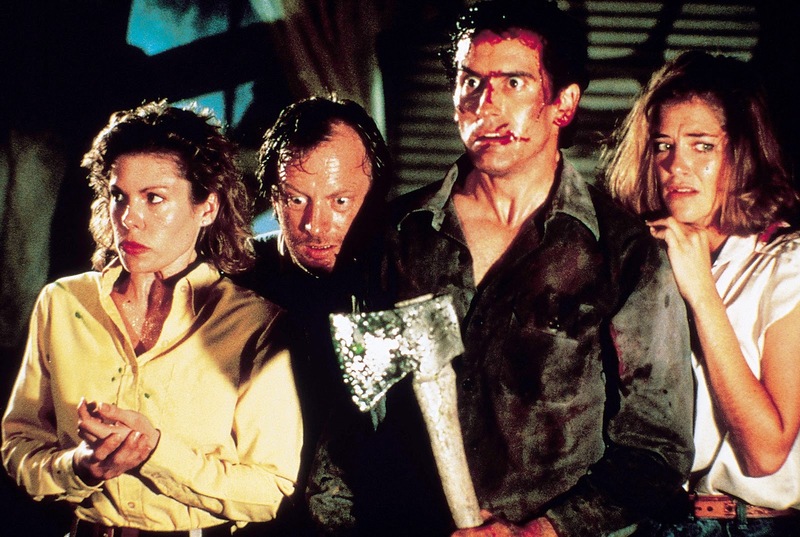 Evil Dead II has gone down in history as one of the top horror films in the genre. I was very fortunate to be a part of it. How much of your own personality have you invested in your 20 years playing Blair on One Life To Live? What you see is what you get when doing daytime for 20 years. Although there are many scenarios that are not realistic and would never happen… But I have enjoyed playing Blair. It was a joyous challenge to bring those ridiculous moments to life and those realistic moments to heart. Blair was a multifaceted character and I tried to find the brightest colors possible to play her. What is it like almost living a double life, with two a television family and a real family? When One Life to Live was first canceled I tried to explain to people that it was like being caught in an affair and I couldn’t see my family anymore. Nowhere in television, other than the long-running soap operas, do you see the history and the families. It’s been great fun to have this wonderful extended family through One Life To Live. What have you thought of the return of One Life To Live? Did everything fall right back in to place or have things changed? It was great to have One Life to live back… But it was certainly different… After working 20 years on network television it was a new adventure for the Internet. I hope it continues on… but we will have to wait and see. New challenges on every level. In all of your years in the Soap world, what are you most proud of? Why? I think it’s the longevity of the career. I was shocked to have been given my first role as Chelsea Reardon on the Guiding Light and equally as shocked to have worked for four years on that show… And I’m even blown away by the fact that I had a 20 career gig on One Life to live. How long do you think you will continue to do the show? I love to work… So it’s really up to the genre. I’m proud to be apart of the soap world. I understand you started out performing at The Grand Ole Opry at a young age. Have you returned to music since? I never left it. I’ve recorded 3 CD’s and continue to sing. My Husband and I did the musical 110 in the Shade last spring. A new musical challenge and great fun. I adore Kassie as a person and as her character “Blair” on OLTL! I am praying that it comes back on TOLN via PP! I have emailed and signed a petition as well to bring back OLTL! I love Kassie DePaiva!!! She’s an amazing actress and a fabulous person as well!!! Hoping OLTL comes back to the internet…. been watching for so many years!!!!!!!!!! your a great woman and in our little UNION CO. KY. town while the corns being picked and this is a favorite time so proud of you no matter what u do kinda like the NO NO COMMERCIAL haha enjoy maybe some day I LL SEE YA IN OUR LITTLE TOWN . Love this interview and Kassie! I hope OLTL comes back, There is such a huge void without it. I have followed OLTL since day 1.. I could never stop watching as long as it is running. My family come into the living room while I am watching the show and tease me about what is going on for so long. I think they all enjoy catching s little bit but would not admit it.. I hope that Oprah realizes that having the show on her channel brings in viewers for her other shows..
Love Ms DePavia’s interview! Miss you much. I cried right with Blair when Todd left knowing he wasn’t coming back since he is on #gh. I hope Oprah keeps it running please. Like Ms DePavia its like not seeing family any more. “Did you see what Todd and Blair did today? Or Dorian and Vicki, Bo and Nora,, I can’t tell you the hours of sheer joy OLTL has bought to my life..Why would I want to give that up without a fight…I love the actors and lets face it..we need to keep our soaps every kid I know growing up watched it with a grandmother, mother, friend, co workers , etc.. Please lets have a voice, as Oprah said when it first aired on OWN she said ” YOU ASKED I LISTENED” to the viewers…I won’t give up on OLTL , it would be like giving up on my family..Let OLTL live on!!!! !